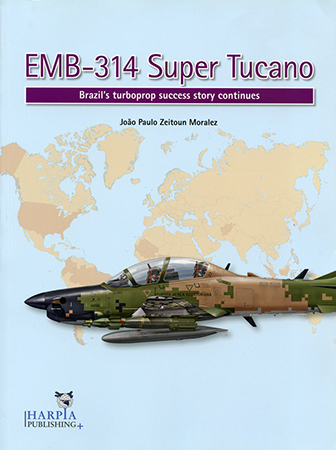 João Paulo Zeitoun Moralez continues his superb study of "Brazil's turboprop success story" with EMB-314 Super Tucano. Like Harpia's companion volume on the EMB-312, this handsome, lavishly illustrated effort sports dozens of color photos and plates. In fact, I counted over 100 individual profiles, badges, and insignia alone – valuable artwork when planning and painting Hobby Boss' 1:48-scale kit. Profile captions helpfully include FS and RAL camouflage matches, as well as armament notes. And photos of operational machines usefully illustrate weathering patterns. Case studies showcase Super Tucano's almost legendary potency, flexibility, and economy. And plenty of intriguing details tincture text. Did you know, for instance, that study of a preserved Curtiss P-40 actually helped guide design of Super Tucano's wing-gun installations? Anecdotes, abbreviations glossary, serials, tables, and extended captions, also augment the account. I just wish Harpia offered more photos and plan views showing dorsal camouflage patterns and starboard aspects – notably Ecuador's intriguing, wrap-around "digital" warpaint and Chile's "Vietnam-style" scheme. Seasoned hobbyists seek specifics like those for accurate color placement. Still, this terrific tome robustly resumes the Tucano tale in solidly sweeping style. And as the worldwide scope of Super Tucano service continues growing, I sense an updated sequel in a few years. In the meantime, buy this brilliant book – and Harpia's landmark volume on the EMB-312. Together, they comprise the finest available English-language study of "Brazil's turboprop success story".